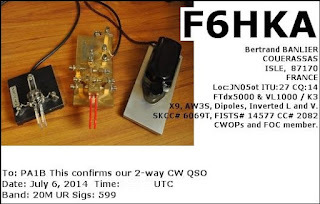 Here is an analysis of very interesting WSPR spots, that were made by Jaap PA0O. 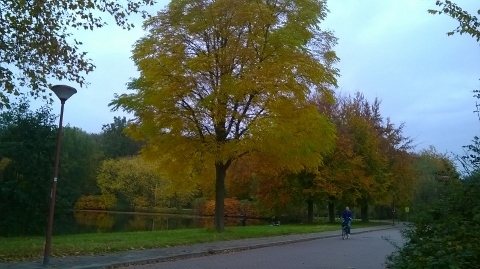 The spots were made from the 19th of oktober until the 12th of november 2015. 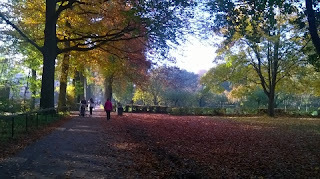 The band was 160 meter. 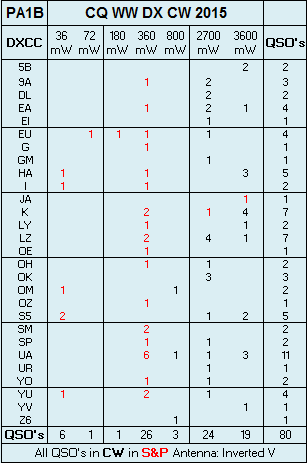 To reduce the length of the table, I only listed the stations that received more than 60 spots. 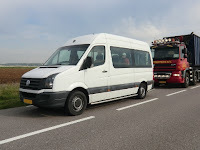 The strongest signal was received by G8DYK over a distance of 600 km. 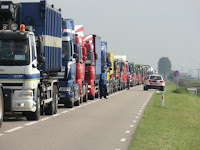 The longest distance was 6400 km, to N8OQ. The lower the Calculated lowest possible power, the stronger the signal. 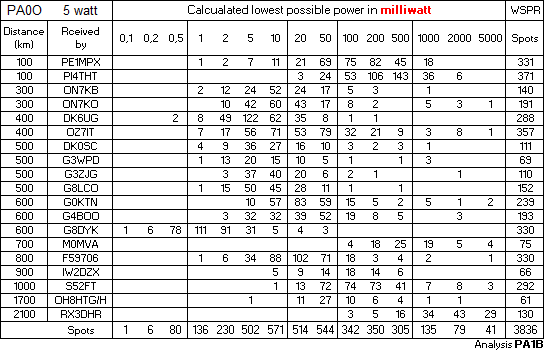 A Calculated lowest possible power of 1 milliwatt, means that a signal with a power of 1 milliwatt, should be received with a SNR of -29 dB. This is a solid copy in WSPR. 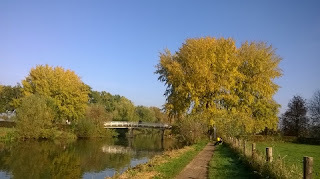 Spots over 2000 km or more. Thanks Jaap for the interesting data. 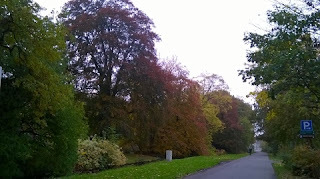 I very much like to answer a SWL card, because I know that my card is very much appreciated. 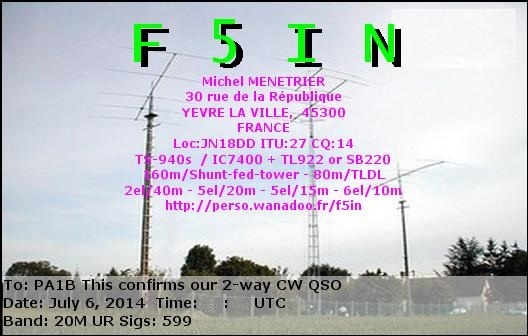 In the eQSL Inbox, I found a very nice card, from a SWL station. 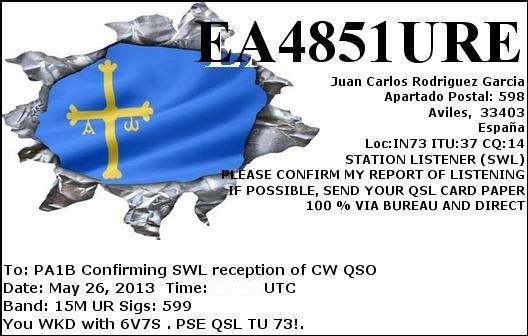 Juan EA4851URE - SWL confirms my QSO that with 6V7S from Senegal, West Africa. 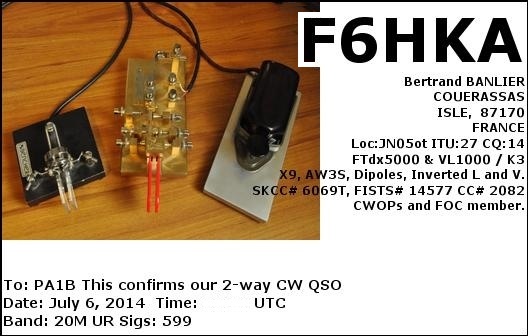 The QSO with 6S7V is made with 2.7 W over a distance of 2852 Miles and is good for 1056 Miles per Watt. hi. Thank you Juan for your beautiful eQSL. 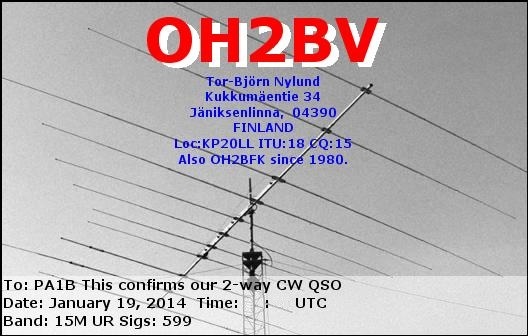 It's great to receive a QSL of a SWL station. 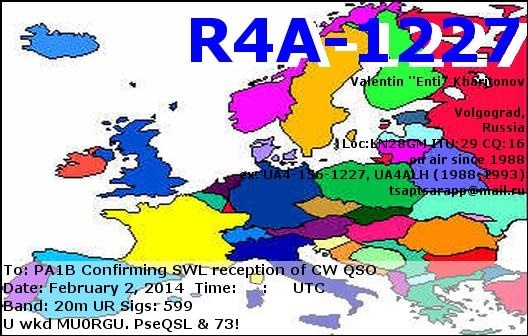 In the last batch of eQSL's I found a eQSL from Valentin R4A-1227 that really knocks my socks off. 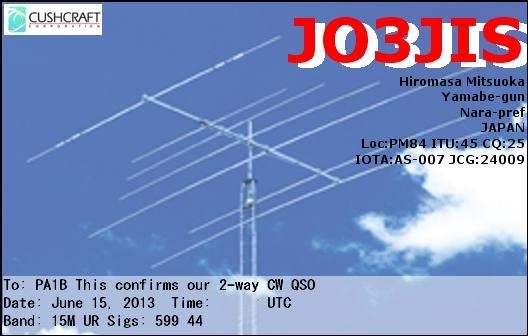 This eQSL is very special, because of the very low power, that I used. 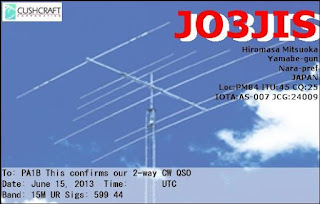 I made a QSO with MU0RGU. The signal was very strong, so I decided to answer with 36 mW. 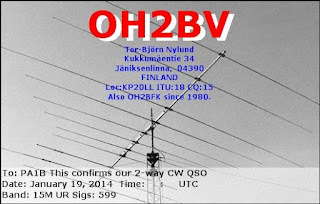 The QSO was heard by Valentin R4A-1227. 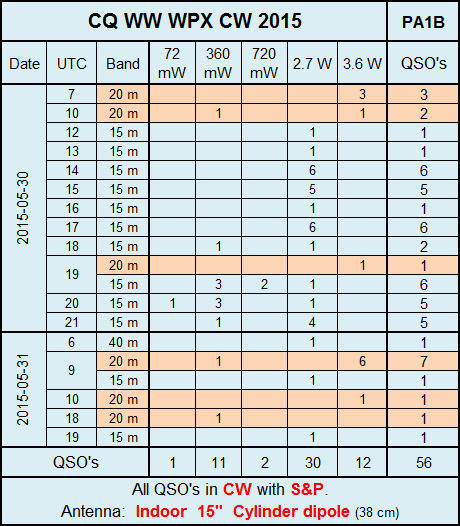 This SWL report and the QSO with M0RGU are both good for more than 1000 Miles per Watt. PA1B to R4A-1227 over 1734 miles to LN28gm with 36 mW gives 48180 Miles per Watt. 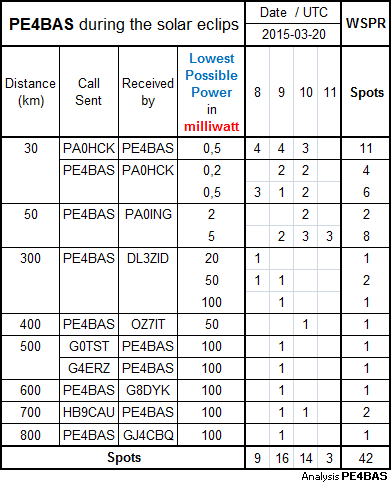 PA1B to MU0RGU: over 378 miles with 36 mW gives 10496 Miles per Watt. Thank you Valentin for the very special eQSL. FB. 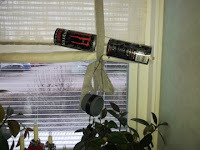 In the photo you see the cylinder dipole with open Monster cans. 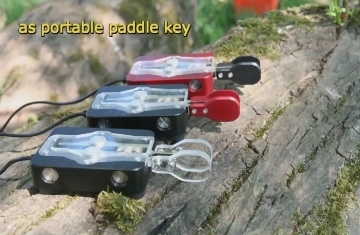 The cans are connected to the coil. I made radial cuts in the top and the bottom of the cans and I bent the points inwards. Later I pushed the white tube, which has a diameter of 40 mm, through the holes. 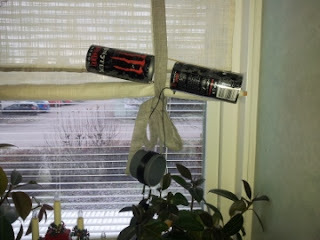 The coil is hanging below the cans and the tube. This coil has 9 turns on a PVC tube with a diameter of 80 mm. The distance between the cans is equal to the diameter of the cans and is 65 mm. The distance between the cans is not fixed, but can be made smaller by shifting the cans. On both sides of the coil I have attached a single turn, coupling loop. 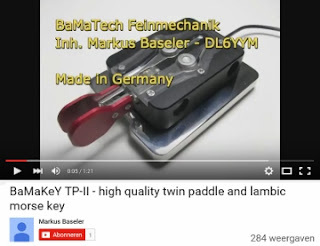 The loops are lightly coupled to the coil. 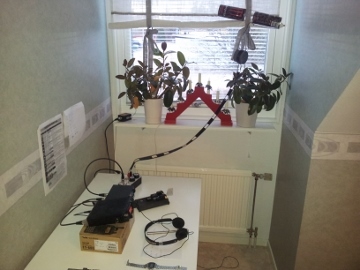 One loop is connected with the RF generator. 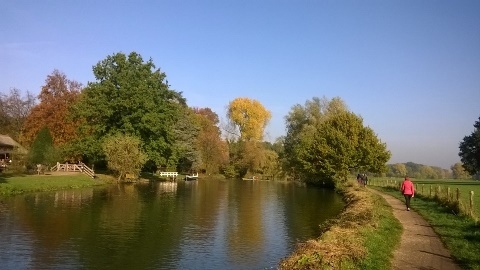 The other is connected to the oscilloscope. 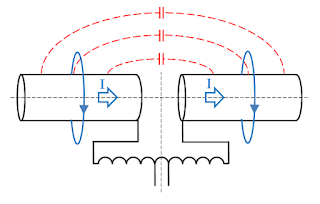 It's very simple to measure the resonance frequency of the cylinder dipole. By adjusting the frequency, I just peak the signal on the oscilloscope to determine the resonance frequency. In this cylinder dipole I use open cans, because they show less capacity between the closed tops of the cans. This capacity does not contribute to the current on the surface of the cylinders. The cylinder dipole with the open Monster cans and the 80 mm coil with 9 turn, resonates at 18.9 MHz. 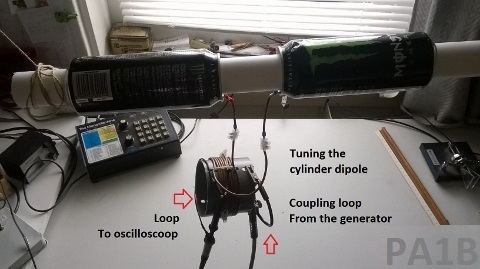 This is a higher frequency of the closed monster cans, which resonates at 16 MHz. The capacity of the open can is lower than the capacity of the closed cans and also because the cylinders are further apart. I use the Cylinder Dipole on 21 MHz and 14 MHz as an indoor antenna in CW contests. 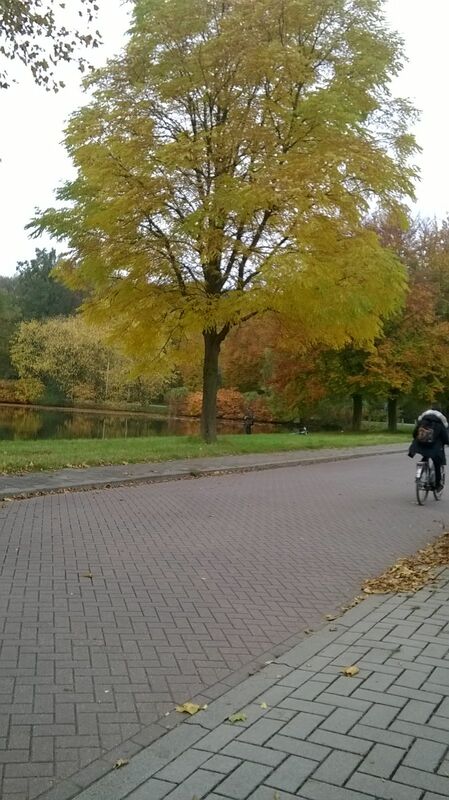 1 November startte als een mistige dag. Maar na het ontbijt was het zonnig. 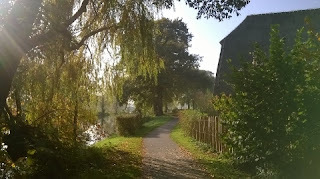 We maakte een prachtige wandeling langs de Kromme Rijn bij Rhijnauwen. We hebben genoten. Het was mij begin deze week al opgevallen, dat de Nieuwsbrief van de Benelux QRP club nog binnen was. 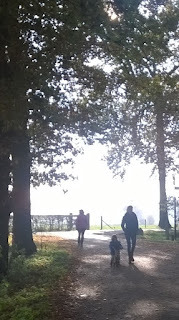 Vandaag vroeg mijn vrouw: "heb jij wat besteld? ", toen ze zag, dat er een pakket in ons kleine buitenbusje zat. Het pakket bevatte het Jubileumboek BQC en de nieuwe nieuwsbrief van september 2015. 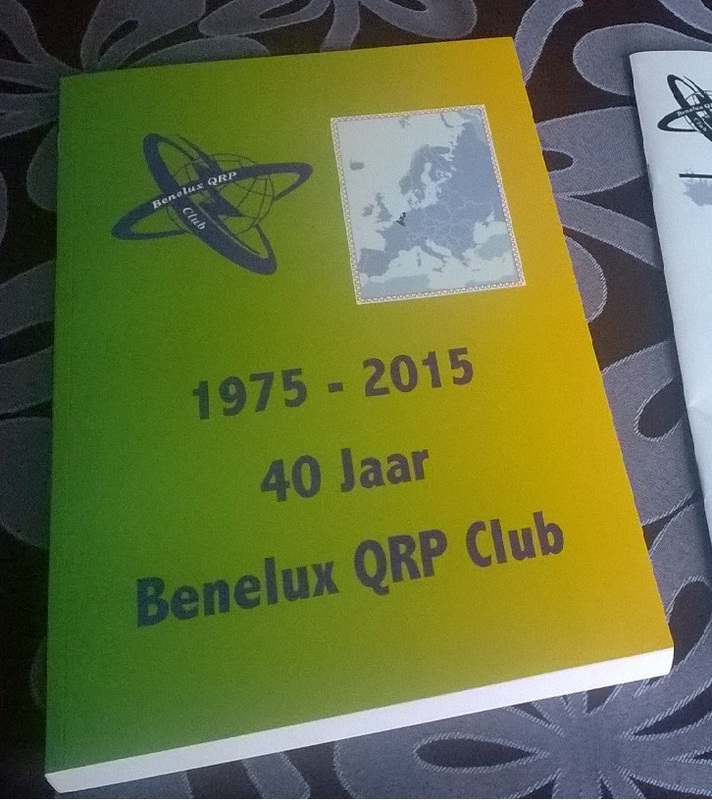 Het Jubileumboek bevat vele interessante artikelen uit 40 jaar BQC nieuwsbrief en telt maar liefst meer dan 290 pagina's. 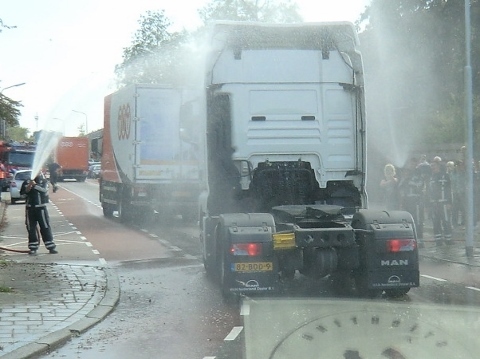 De artikelen bestrijken een periode vanaf de oprichting van de BQC tot nu. Petje af, voor zo'n dik en goed verzorgd boek dat is samengesteld door Ben Santen en is bewerkt door Marc Schijven. 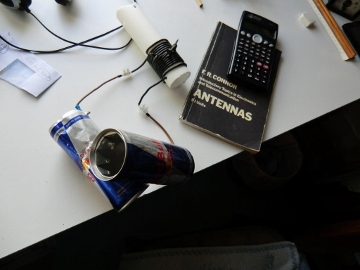 After the experiment with the Red Bull antenna, I built a second Cylinder Dipole with two energy drink cans of 500 ml. The cans together with the coil resonate at 16 MHz. 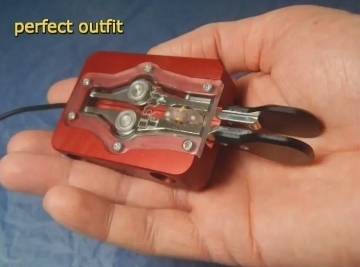 The 300 ohm ribbon is connected to the point at the top of the coil (in the picture) with the red and yellow alligator clips (See the white arrow in the top of the picture). 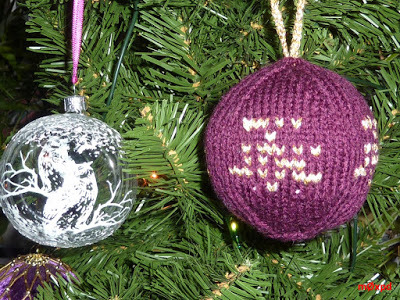 The antenna is hanging from the ribbon. 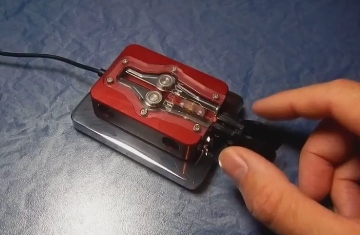 I can tune the cylinder dipole for the a SWR of 1;1 with my symmetrical tuner. 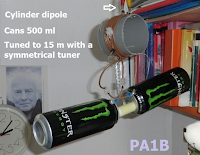 PA1B Cylinder Dipole. The current at the surface of the cylinder generates the field. In this antenna I used the complete can, without removing the top and the bottom of the can, to keep the construction simple. Closed cylinders are much stronger than open cylinders. Although it is not easy to compare two antenna's, that were used in two different contests a week apart, the cylinder dipole with the 500 ml cans is probably better than the Red Bull antenna. 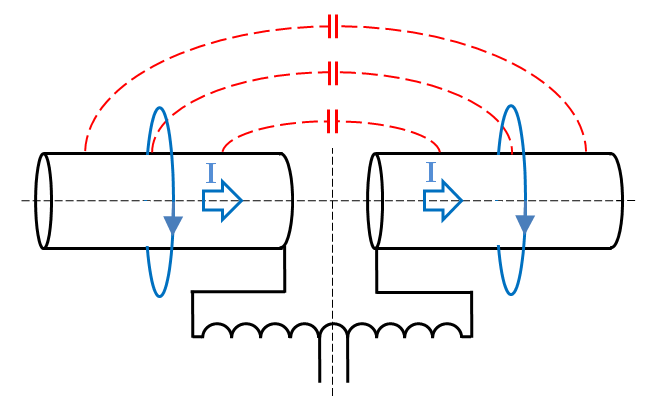 In general the cylinder dipoles are very quite on receive. 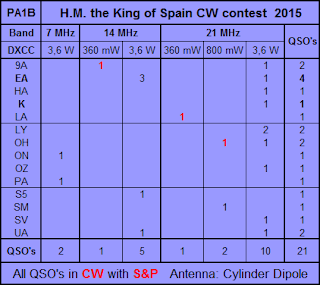 In the H.M. King of Spain contest I made QSO's on 7 MHz, 14 MHz and 21 MHz. 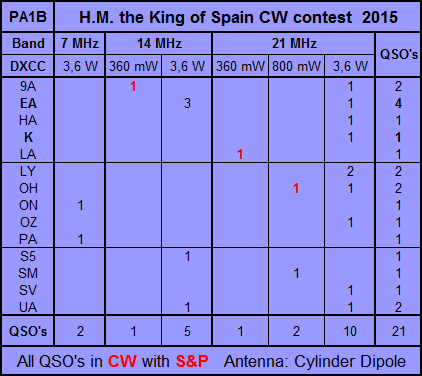 Most QSO's were made on 21 MHz with a power of 3.6 W to 360 mW all over Europe. 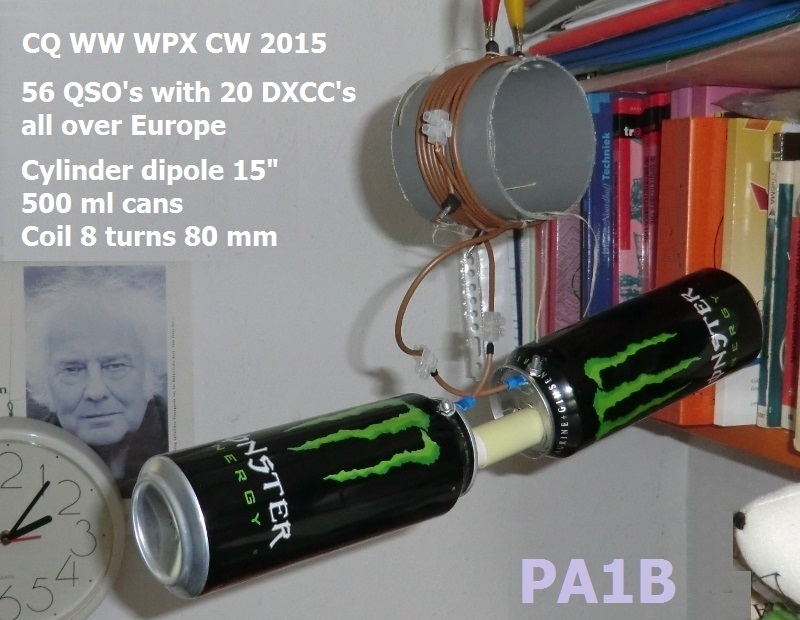 This cylinder dipole with two 500 ml cans works better on 21 MHz than on 14 MHz. The antenna is "detuned" to 21 MHz with the symmetrical tuner. 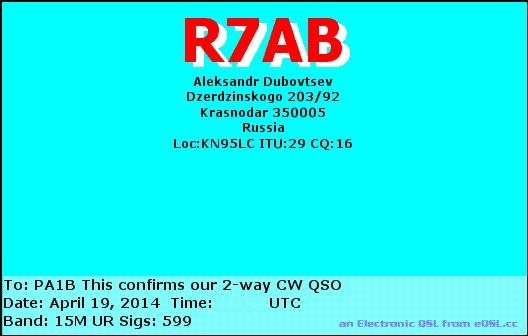 On 7 MHz it was very difficult to make a QSO. 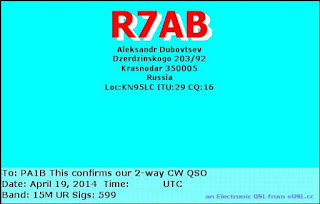 The QSO's on 7 MHz were made over a short distance. NVIS. I estimate that the lower efficiency at 7 MHz reduces the signals with 10 dB. 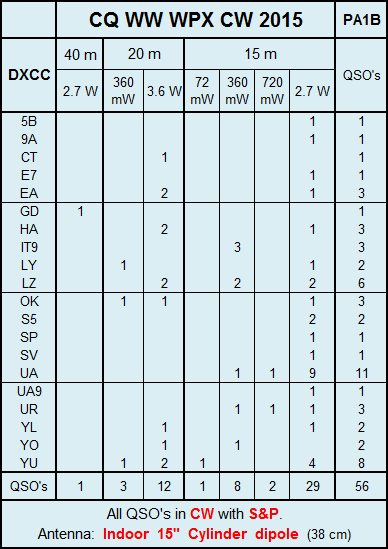 The table below shows the DXCC countries per band and per power category. 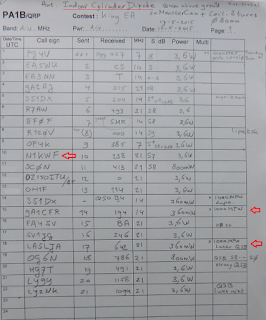 I very much enjoyed the QSO with N1KWF in New Hampshire over a distance of 3490 Miles, with a power of 3.6 Watts. * at a height of 4 meter above the ground. 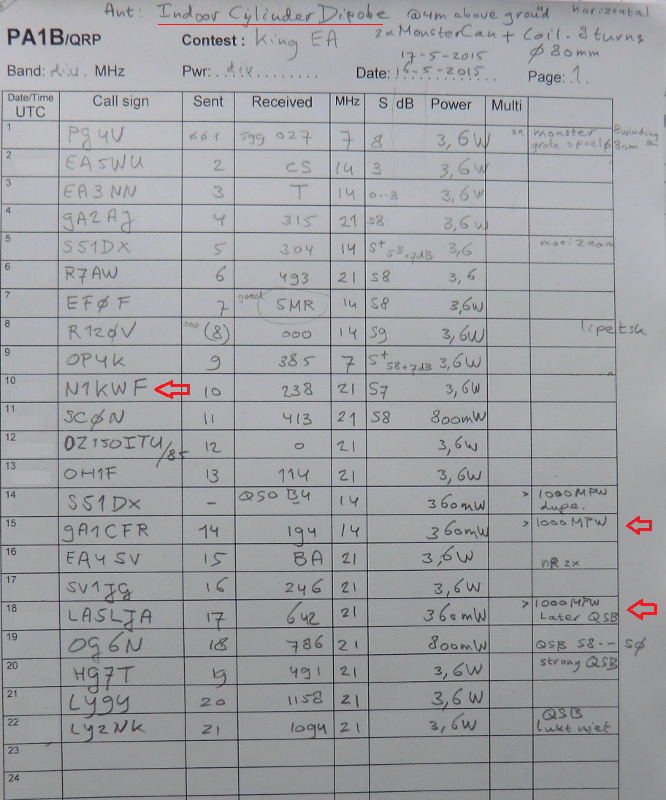 Click on the table below, to read the hand written log, in which I write down the power in each QSO. 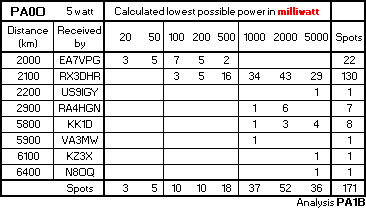 The QSO's in red are more than 1000 Miles per Watt QSO's.